Trip Description : The park covers a total area of 102 sq.km of which about only 180 sq. km is land. The National Park does not encompass the island chain, its jurisdiction covers about 82 % of the total area.The Park was established on 12th November 1980. Depart from pier to Angthong Marine National Park, about 1 hour away. 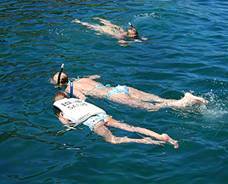 Arrive at “Wao Island” The best snorkelling amongst the diverse marine life of the area. 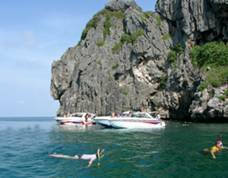 Reach to “Sam Sow Island” and cruise through the magnificent beauty of the Angthong National Marine Park, our experienced guide will lead you to explore the ancient limestone cave by sea canoe or kayaking. 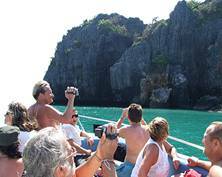 Depart from Sam Sow Island go to white sandy beach in middle region of Angthong Marine Park area. Enjoy a great buffet lunch on the beach. After lunch you can get the free time to explore the surroundings and relaxing on the beach. Depart from beach by speed boat again to Mae Koh Island after morning the boat takes an easy. 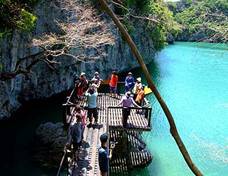 But spectacular climb through the dense rain-forest, that take you to the Green Lagoon and island view point. 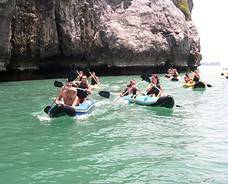 Depart from the National Marine Park head back to our elephant camp at Samui Island. Meet and feed the Baby Elephants. And we have 2 different choices. For you found one, “Between Elephant Trekking & ATV Quad Bike”. 16.30 Transfer back to you hotel. REMARK: The Program to be change depending on weather conditions. Lunch include – Fried rice, Thai Curry Chicken, Fried Chicken, Fried vegetable Fruits, soft drink and Drinking Water.